The last week of 2013 is shaping up to be a good one for death metal of the ignorantly technical (it’s a thing), slam-heavy variety. 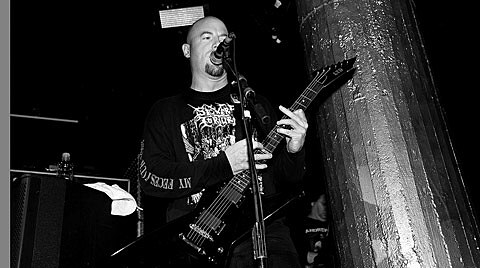 We already mentioned that Suffocation and Pyrexia will be playing a show at Webster Hall’s Marlin Room on 12/28 (tix here). Two days later, Pyrexia will join the long-running and even more slam-centric Dying Fetus for another gig, this time at Saint Vitus on December 30 (tickets here). Dying Fetus typically play substantially larger venues — they headlined Gramercy last time they came to town — so expect close quarters at this one. The following day (12/31), both Dying Fetus and Pyrexia will head to Hartford, CT for a New Year’s Eve show at the Webster. (Not to be confused with Webster Hall here in NYC.) Revocation, Internal Bleeding, and Sexcrement (yeah…) will join in the fun. Tickets for that show are on sale as well. Chances are pretty good that DF will sell out the Vitus gig, so you’d be wise to pick up a ticket in advance if you’re interested. Stream their peak effort Destroy the Opposition below.